Dometic Follow the Sun wraps up on Monday 31 October at Nagambie Lakes Leisure Park with a Grand Finale celebration for the luckiest road trippers in Australia. 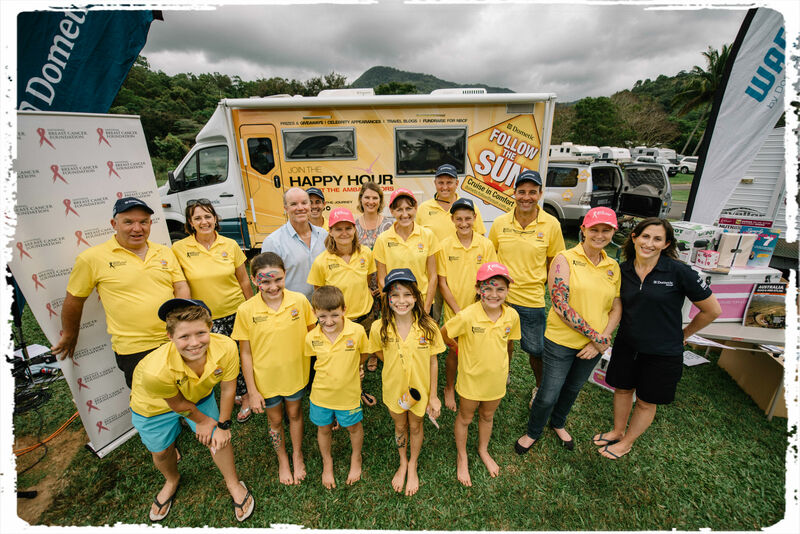 Free for all to attend, the event will mark the final stop for the 2016 Dometic Follow the Sun Ambassadors, who embarked on a 13-week expenses paid trip down the east coast of Australia, raising funds for the National Breast Cancer Foundation (NBCF). Channel Ten’s What’s Up Down Under is hosting the celebration as part of its Go Make Some Memories Convoy for Charity from 5.45pm, and will feature a range of games, raffles and competitions with fantastic prizes. Hit country singer Tania Kernaghan, jazz band Briefcase Full of Blues and a fireworks display will top off the evening. Dometic Follow the Sun Ambassadors Kate ‘AdventureMumma’ Richards and her family, ‘My Aussie Travel Guide’ Grant and Linda, and the ‘On the Road Again’ McKay family will regale stories and experiences they’ve shared on the road. “Our family loves adventure and a good road trip; we’ve had the time of our lives cruising for a cause over the past three months”, said Kate. Dometic Australia Head of Marketing Justine Schuller is proud of the Ambassadors and their fundraising efforts throughout the campaign. “The Dometic Follow the Sun campaign is on the verge of raising $100,000 for the National Breast Cancer Foundation, which is an amazing result we are so glad to be involved with, and we want to invite you to come down and celebrate with us,” said Ms Schuller. National Breast Cancer Foundation (NBCF) CEO Dr Sarah Hosking thanked Dometic for their generous support and said that she was looking forward to coming down on the day to celebrate with the Ambassadors. “On average, eight women die every day from breast cancer in Australia. The disease is not just restricted to women, and one in 700 Australian men will be diagnosed in their lifetime,” said Dr Hosking. There will be several raffles and prize draws taking place throughout the evening, including a pink WAECO 68 litre icebox valued at $339, a minor prize pack valued at over $2,000 including prizes from partners such as HEMA, Eco Pot, Caravanning QLD, CIAA, Rapala fishing rods, NAFA Fishing annual, GHD and Milwaukee. Additionally, the Follow the Sun Major Raffle Prize valued at more than $4,500 of Dometic products will be drawn. Dometic Follow the Sun merchandise including WAECO iceboxes, can coolers, bumper stickers, aprons and bucket hats will also be on sale throughout the night. Official proceedings for the Dometic Follow the Sun Grand Finale Party will run from 5pm – 10pm, finishing off with a fireworks display. Entry is free and open to the public.